A single-engine plane was forced to make an emergency landing at Tulsa International Airport on Friday night, and when the landing gear collapsed the aircraft came to rest at a runway intersection, preventing commercial flights from landing. The pilot of the V-tail Bonanza indicated to air traffic controllers that the plane was having alternator problems and needed to land at the airport, TIA spokeswoman Alexis Higgins said. When the plane came in about 8:15 p.m., the landing gear collapsed at the intersection of the main runway and the crosswind runway, she said. Until the plane could be moved, no commercial flights could land on the main runway, but some smaller planes could land on the west runway, Higgins said. She said commercial planes could depart from the west runway. According to the airport's website, about 15 flights were scheduled to land in Tulsa between 9 p.m. and midnight. One plane had already boarded to depart to Houston. 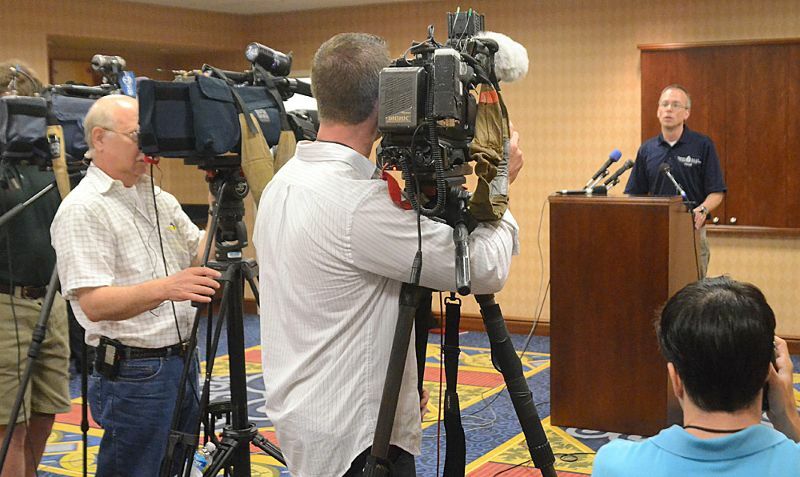 As of late Friday, airport staff did not anticipate any diversions, Higgins said. Higgins did not yet know where the plane came from or where it was headed but said two people were on board and that neither was injured. The airport received word from the FAA just before 9:30 p.m. that the plane could be moved — a process that would take only minutes once a wrecker arrived, Higgins said. 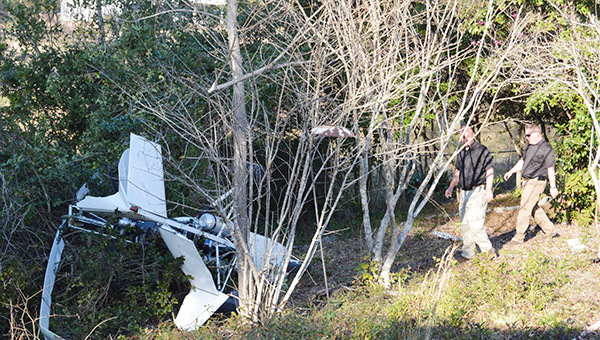 Escambia County Sheriff Grover Smith narrowly escaped injury Friday after his plane crashed near Alco Park. Smith was flying the department’s gyroplane as part of the search for a missing Brewton teen. Witnesses said it appeared Smith hit a pocket of air and clipped a treetop before crashing. Smith walked away from the wreckage, which landed in the backyard of a North Forest Hill Road home. Burt Barton was working on his tractor and saw the crash happen. Emergency personnel were at the lake as part of the search mission and responded quickly up the hill. Flight attendants, looking upset, running in the cabin. The crew told passengers they were making an emergency landing. Within minutes, the aircraft descended so abruptly and rapidly that children in the cabin began to wail. "Everybody was just freaking out," Janovsky said. Flight 872, which departed St. Pete-Clearwater International Airport at 8:19 a.m. Friday bound for Omaha, Neb., made an emergency landing in Birmingham, Ala., because the crew noticed an unusual electrical odor, Allegiant told reporters. Janovsky said the crew told passengers the emergency was caused by "the smell of an electrical fire." The Federal Aviation Administration, which is investigating, said in a written statement the crew reported "smoke in the cockpit." 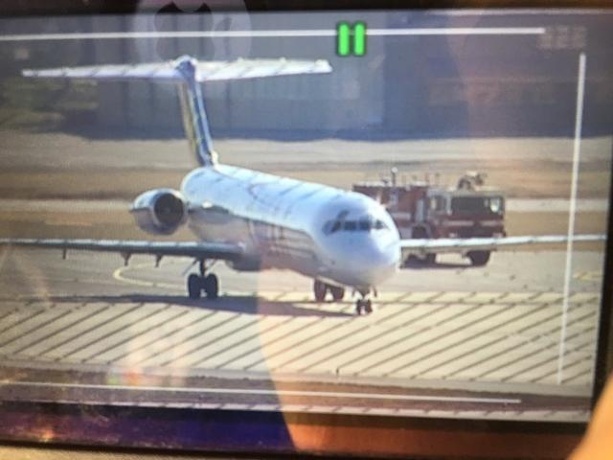 The aircraft, a 27-year-old MD-83, landed safely at Birmingham-Shuttlesworth International Airport with 153 passengers and six crew members. No injuries were reported. The incident is the latest in a string of much-publicized emergency landings by the low-cost, Las Vegas-based airline that included five emergency landings on Florida flights in the last week of 2015. Allegiant aircraft made three emergency landings at St. Pete-Clearwater, one of the busiest airports on its schedule, during one month in the summer. Allegiant, which did not respond to a request for comment by the Tampa Bay Times, told other media outlets passengers would receive a $100 voucher for future travel on the airline. The airline has said it is one of the safest in the industry. Janovsky, 34, a St. Petersburg resident who is a real estate agent and a political consultant, was flying to visit family. A veteran flier, he was on his first Allegiant flight. Seated in row 18 toward the front of the aircraft, Janovsky said he could not smell anything unusual at the time the emergency was declared, but he said other passengers in the back of the plane noticed the odd odor. The plane, he said, shuddered uncomfortably during the rapid descent. At some point, all electricity to the passenger cabin appeared to go out. The small fans above passengers' heads stopped working, and even the seat belt sign went out. Flight attendants communicated with passengers using handheld megaphones rather than the plane's public-address system. In about 10 minutes, the aircraft landed and stopped on the runway. Janovsky said he saw fire trucks and emergency vehicles surround the plane. Passengers, however, were not taken off. The crew said little to passengers as they waited for 20 minutes. "That was a problem," he said. "Everybody assumed the airplane was on fire." One passenger unbuckled her seat belt, Janovsky said, when a flight attendant yelled at her to sit down. Passengers were frightened, Janovsky said, and some talked about opening the emergency doors themselves to get out of the aircraft. In they end, they decided against it. Janovsky said the plane finally taxied to a gate, but he said it took another 30 minutes before passengers were allowed off. As he walked off the aircraft into the terminal, Janovsky said he smelled the strong odor of something electrical burning. "It was like a hair dryer on fire," he said. The flight, he noted, would be his last on Allegiant. "It was terrifying," he said. "Allegiant's like the Russian roulette of the skies." A replacement aircraft from St. Pete-Clearwater flew to Birmingham to take the passengers to Nebraska several hours later. Before leaving Alabama, Allegiant offered passengers a treat for their trouble — free pizza. PITTSFIELD >> Leases involving Pittsfield Municipal Airport land generated considerable discussion during the first meeting of a study group examining how the facility is managed and weighing whether changes could make it more cost-effective. The study group, which was appointed by Mayor Linda M. Tyer after a request from the City Council, held its organizational meeting Thursday at City Hall. The nine-member committee began to discuss how it will examine the airport operation in the coming months — aiming to produce a report in May. Airport Manager Robert Snuck told the committee he found several questionable leases after beginning in the post last year and recently researching the issue as part of an Airport Commission effort to boost revenue while controlling expenses. Snuck said some of the lease agreements he found — particularly concerning a 30-acre parcel carved out of the more than 550-acre airport site for the Westwood Business Center Park — seem to be out of compliance with Federal Aviation Administration or state regulations for airports. For instance the FAA has regulations concerning how revenue derived from airport property can be used, he said. "I think things were done I'll say were under the table," Snuck said at one point. He added that some leases were granted for much longer than the 20-year timeframe normally required in the regulations. Some were for 40 years at $1 per year, with an option for 40 additional years at the same nominal cost, Snuck said. 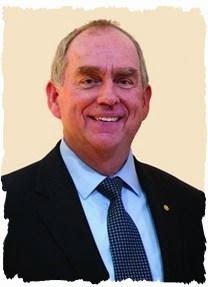 Airport Commission Chairman Christopher Pedersen, who is a member of the study group, said on Friday that it remains unclear exactly what agreements were reached when the Westwood park was created during the mid-1980s, but he believes additional paperwork might be found to clarify the situations. He said there is evidence that the several parties involved were discussing agreements at the time, but not all paperwork has been located. Putting the matter into context, he said the two leases granted for 40 years at $1 a year were on the five acres of the Westwood park that is owned by the city, while another 25 acres is owned by the airport. Overall, he added, total revenue on leases there is low, "maybe $6,000 annually," and not a major potential source of income to support the operation. Pedersen said it also is typical of many industrial or business park sites that incentives, such as a tax break or low lease figure, are used to lure a business to the area. All of the park parcels are now leased, he said. There are at least seven available business sites at the Barker Road park. Thomas Sakshaug, chairman of the study committee, said the group will want to review all leases associated with the airport and asked for copies of that information, along with other financial details of the operation. Former Ward 5 Councilor Jonathan Lothrop — who for many years represented the ward where the airport off Tamarack Road is located — asked for spreadsheets of the financial data on which categories could be added. He offered to put that part of the study together as a subtask, and that was agreed to by committee members. Ward 4 Councilor Christopher Connell, current Ward 5 Councilor Donna Todd Rivers and Councilor at large Melissa Mazzeo petitioned the council last month to ask Tyer to launch a study. Connell and Mazzeo had in the past raised the issue of whether having the city manage the airport is cost effective compared to other arrangements, such as privatization. Those three councilors were named to the committee, along with Lothrop and Sakshaug. Also selected by Tyer were Michael Lyon of Lyon Aviation, which acts as the fixed-base operator private firm at the airport, providing services like fueling and hanger space for craft using the facility; Pedersen, Ashley Sulock, and attorney C. Jeffrey Cook. Connell and other members said they want to focus first on the financial details of the operation, including budget figures like revenue and expenses, staffing and long-term plans for airport upgrade work, in the pipeline or being discussed. Snuck and Airport Inspector Brian Spencer, the two city employees, also attended the group's organizational session. Sakshaug won agreement for a second meeting on Feb. 25 and tentatively set a third meeting for March 9. Both sessions were scheduled for Room 203 at City Hall at 7 p.m.
Pedersen said the airport offices also would be used for meetings if space is unavailable at City Hall. Sakshaug said he wanted to schedule one or more meetings there so that committee members can view details of the facility. The airport dates to 1932, Snuck said, opening with only the smaller, unpaved runway that now runs at an angle across the main runway. The main runway was lengthened and the approaches cleared back during a multi-year, $21 million project that will conclude this spring with repaving for old sections of the runway. The improvements, financed primarily through federal and state grant funding, were designed to allow larger craft to use the airport and meet updated FAA safety requirements. For most such projects, the city has supplied a small percentage of the overall cost, from 5 to 10 percent of the total. Lyon said the facility is regularly used by people and businesses from around the county, such as second home owners and Williams College or Canyon Ranch visitors. The use "is definitely countywide," he said. The Westwood Center park is managed by the Pittsfield Economic Revitalization Corp. PERC officials could not be reached Friday for comment. WASHINGTON—U.S. air carriers will begin competing for routes and airport slots for travel to Cuba on Tuesday when an agreement takes effect to restore normal commercial air service between the two countries. The U.S. and Cuba are expected to formally sign an agreement in Havana to resume air service between the countries. Once that happens, air carriers will have 15 days to submit applications to the Transportation Department for the routes they’d like to fly. Senior U.S. officials said they expect to make a decision about which carriers get which routes this summer, and U.S. airline carriers will be able to sell tickets for them this fall. “There’s no restriction on aircraft type or aircraft size, and so we expect to see additional analysis on what folks view the overall travel demand and traffic patterns between certain U.S. cities and certain U.S. regions to Cuba,” said Brandon Belford, deputy assistant secretary for aviation and international affairs at the Transportation Department. The deal reached in Washington in December allows for up to 110 flights per day to Cuba, including 20 to Havana and 10 to each of Cuba’s nine other international airports. U.S. officials expect there will be more demand than supply for the Havana flights, so that will generate intense competition for those routes. While the agreement allows for 110 flights per day, it is unlikely so many daily flights to Cuba will begin by the fall. For the routes to areas outside Havana, Mr. Belford said, the U.S. could decide to award those flights before the summer because there likely won’t be as much competition. American Airlines Group Inc. said Friday it will apply to offer scheduled flights to the island nation that it has been serving for 25 years with charter flights. A spokesman for the largest U.S. airline by traffic said American will apply for permission to fly from Miami and other American hubs, which he declined to identify, to Havana and perhaps other Cuban destinations. Currently, American offers 24 weekly charters to Cuba from Miami; Tampa, Fla.; and Los Angeles. JetBlue Airways Corp. also said they’d apply to offer regularly scheduled flights to Cuba, where it has operated charter flights since 2011. “Our focus cities in New York and Florida are natural gateways to Havana and other Cuban destinations,” said Doug McGraw, a JetBlue spokesman. Currently, there are about 10 to 15 daily charter flights to Cuba, primarily from Miami to Havana and other airports. American Airlines has charters from Miami; Tampa and Los Angeles, and JetBlue Airways Corp. flies from New York; Fort Lauderdale, Fla.; and Tampa. Delta Air Lines Inc. has in the past offered charters from New York, Atlanta and Miami. Charter service will continue without any restrictions on the number of daily flights. The coming restoration of normal commercial air service “provides for a very important sizable increase in travel between the two countries, and that reinforces the president’s objective,” Mr. Engle said. The pilot reported that on his second landing he felt a "small" impact just before touchdown, and then the airplane pitched down and skidded to a stop. The pilot further reported that after the airplane came to a stop, he observed smoke coming from the lower left side of the cowling just forward of the firewall. As a result of the post-impact fire that ensued, the airplane was destroyed. The pilot reported that he observed evidence of where the airplane's nose wheel impacted a snow berm located on the approach to the runway. He estimated that the snow berm was about five feet high and about twenty feet wide. The airport manager reported that about four inches of snow accumulated on the ground prior to the accident, but that almost all of the snow had been plowed from the runway. 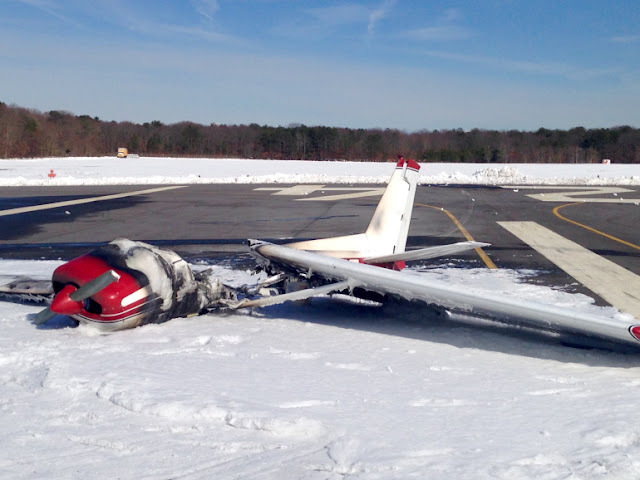 He further reported that the accident airplanes nose gear impacted a snow berm that was about 10 feet off the end of the runway, and about 28 inches high. The pilot's failure to maintain adequate terrain clearance while landing, which resulted in a collision with a snow berm, nose gear collapse, and postimpact fire. A small, private single-engine plane was significantly damaged by a fire that started after it touched down Friday morning at Brookhaven Calabro Airport in Shirley, officials said. 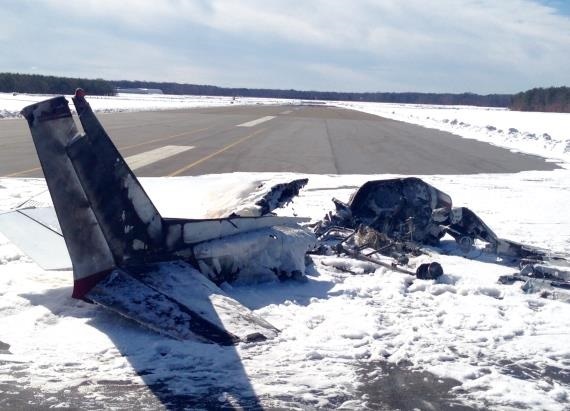 A spokesman for the Town of Brookhaven, which operates the airport, said the plane, a two-seat Cessna 152, had just landed and was “taxiing down the runway” when the engine caught fire. The Federal Aviation Administration said its initial characterization of the incident was a crash-landing. The incident was reported in a 911 call at 10:12 a.m. The FAA and Suffolk County police said there were two people aboard the plane, which had earlier departed from Long Island MacArthur Airport. Neither person was injured. Town spokesman Jack Krieger said indications are the pilot was scheduled to fly from MacArthur to Calabro. Krieger said Calabro Airport had been closed as a result of the incident. It was not immediately clear how long the airport would be closed. 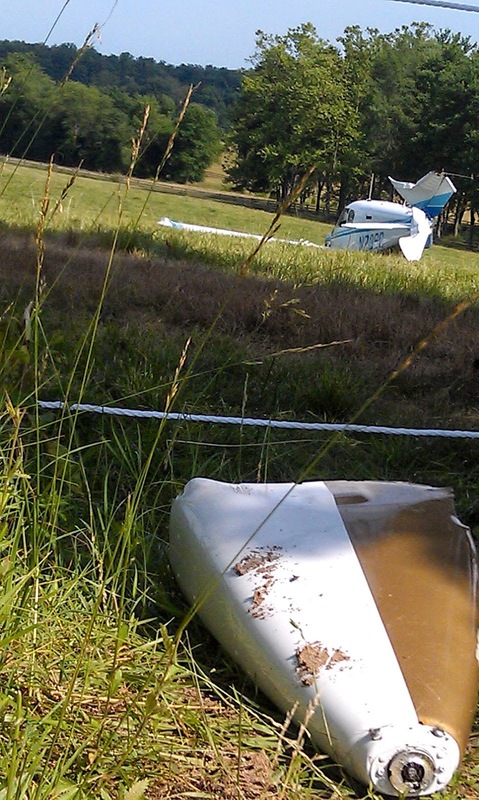 Photos from the scene showed the high-wing Cessna off to one side of the runway, its wing collapsed and the cockpit section of the plane virtually destroyed. Fire officials said that, in addition to Suffolk police, firefighters from the Mastic Fire Department responded. SHIRLEY, New York – A small plane with two people aboard crashed at Brookhaven Airport Friday, bursting into flames after the occupants managed to escape. The plane ignited after the pilot landed the aircraft on the northern end of the runway around 10:12 a.m., according to officials. The pilot and the passenger of the Cessna 152, two men who haven't been identified, ran from the plane and weren't hurt. Federal Aviation Administration and the National Transportation Safety Board officials are investigating. SHIRLEY - Police say a plane crashed this morning at Brookhaven Airport in Shirley. According to police, two people were on board the single engine Cessna C-152 plane. The plane took off from MacArthur and was heading to Brookhaven when it crashed there around 10:20 a.m.
Police say both people got out of the plane unharmed before it went up in flames. Aircraft gear collapsed on landing. The Beechcraft V35B Bonanza (registration N6658R, serial number D-103232) was in a shallow climb, heading southbound, in the vicinity of Warrenton, Virginia. The aircraft was operated under visual flight rules for the purposes of a biennial flight review. The Piper PA-28-140 (registration N23SC, serial number 28-21217) was in level flight, also under visual flight rules, and was heading in a southeasterly direction. At 1604:45 Eastern Daylight Time, the aircraft collided approximately 1800 feet above sea level. The Beechcraft broke up in flight, and the pilot and flight instructor were fatally injured. There was a post-impact fire at the Beechcraft accident site. The pilot of the Piper, who was the sole occupant of the aircraft, conducted a forced landing in a pasture, approximately 6 nautical miles south of the Warrenton-Fauquier Airport. The pilot sustained injuries, which required examination at a local hospital. The Piper was registered to a Federal Aviation Administration (FAA) employee, and the Beechcraft was registered to a National Transportation Safety Board (NTSB) employee. Given the unique circumstances surrounding the ownership and operation of the accident aircraft, the United States, as the State of Occurrence, represented by the NTSB, and Canada, represented by the Transportation Safety Board (TSB), respectively requested and accepted delegation of the accident investigation, in accordance with paragraph 5.1 of Annex 13 to the Convention on International Civil Aviation (International Civil Aviation Organization). The pilot of the Beechcraft V35B Bonanza arrived at Warrenton-Fauquier Airport (KHWY) at 1515 Footnote 1 to pick up an instructor in order to complete a flight review. Footnote 2 With the certified flight instructor on board, the Beechcraft departed at 1545, headed south, and climbed to 3000 feet above sea level (asl). No enroute air traffic services were requested by the pilots of the Beechcraft, nor were they required to do so in the airspace in which they were operating. The recorded radar data indicated that the Beechcraft was transmitting on transponder code 1200. At 1555, the northbound Beechcraft was 13 nautical miles (nm) south of the Culpeper Regional Airport (KCJR) at 3000 feet asl. At this time, the Piper PA-28-140 departed KCJR under visual flight rules (VFR) and was climbing eastward. At 1600, the Beechcraft started a descent. As the Beechcraft descended, their closest point of approach was 600 feet vertical and 0.9 nm lateral. It is not known if either pilot saw the other aircraft, or if the 2 aircraft were on the same radio frequency. At 1601, the Piper levelled at about 2000 feet asl and was proceeding to the ANTNY intersection (Appendix A - RNAV [GPS] RWY 33 Warrenton-Fauquier). The pilot contacted the terminal radar approach control (TRACON) for the area, which is called the Potomac Consolidated TRACON (PCT) Barin sector, and requested an area navigation (RNAV) approach to Runway 33 at KHWY (Appendix B – Airspace and Airports). The PCT Barin sector controller asked the Piper pilot to standby, as the controller was coordinating with another controller regarding 2 instrument flight rules (IFR) aircraft crossing north of the Piper’s position. Radar information showed 2 VFR aircraft in the vicinity in addition to the Piper and the Beechcraft. At 1602:18, the PCT Barin sector controller acknowledged the Piper pilot’s request and asked the pilot to enter a discrete code of 4323 on the transponder. As a result, a data block showing the aircraft registration, altitude and speed was associated with the Piper’s radar target. A controller position handover Footnote 4 was then conducted, starting at 1602:34. The relieved controller was interrupted by a call from an aircraft, and then resumed the handover briefing. Information passed to the incoming controller included a number of arrivals and departures from Washington Dulles International Airport (KIAD) and Manassas Regional Airport (KHEF), the crossing IFR traffic and the Piper’s request for an RNAV approach. The briefing was concluded at 1603:18. When the relieved controller saw that the incoming controller had control of the situation, the relieved controller left the position to go on break. The incoming controller then requested the Piper to squawk ident Footnote 5 and confirm the airport and type of approach requested. The Piper complied with the request and pressed the ident button on the transponder. At 1603:33, having missed the ident, the controller again requested that the Piper squawk ident; the controller then focused on another aircraft destined for KHEF. At 1604:08, the audio conflict alert (CA) sounded and the visual alert appeared at the controller’s position. The incoming controller heard and observed the alert; the relieved controller had left the position and did not hear or see the alert. The audio alert for the conflict ceased after approximately 5 seconds, but the visual alert Footnote 6 continued to be displayed. When the CA sounded at 1604:08, the Beechcraft had started a slow climb and was headed southbound on a converging course with the Piper. The Beechcraft was about 500 feet below and approximately 0.9 nm east of the Piper. The controller noted the vertical spacing, assessed that there was no conflict, and returned to ensuring that separation was going to be achieved between the 2 IFR aircraft to the north on crossing tracks. In the 44 seconds from 1604:10 to 16:04:54, the controller was communicating with several IFR aircraft in the airspace. The controller issued several instructions to the pilot of 1 of the 2 IFR aircraft on crossing paths, including a level‑off altitude in 2 miles and a frequency change, with the last acknowledgement from that airplane beginning at 1604:35. At 1604:38, the controller issued a frequency change to a third IFR aircraft, and received an acknowledgement at 1604:40. At 1604:43, a pilot from another airplane (fourth IFR aircraft) checked onto the frequency; the controller issued an altitude assignment, advised this pilot that the aircraft was number 3 to land at its destination, and received acknowledgement at 1604:50. There were no CAs associated with any of the preceding aircraft. At 1604:54, the PCT Barin sector controller, confident that separation was going to be maintained between the IFR aircraft, advised the pilot of the Piper that the aircraft had been radar identified. Footnote 7 The controller then asked the pilot to climb to 3000 feet asl, and indicated that there was traffic in the area. There was no response from the Piper as the collision had already occurred. The Piper and the Beechcraft collided on a 45° convergent path from the Piper’s left side. The Beechcraft’s landing gear was retracted, and the flaps were set to 15°. Field-of-view analysis showed that there was a high likelihood that each aircraft was visible to the other, meaning that no aircraft structure would have obscured the view of either approaching aircraft (Appendix C – Approximate Fields of View). The Beechcraft pilot’s view may have been obscured by the instructor’s head, depending on each pilot’s seat position and posture, but the instructor’s view would have been unobstructed. There were no indications that either aircraft manoeuvred to avoid the other. As the 2 aircraft collided, the Piper’s propeller severed the Beechcraft’s fuselage just aft of the pilots’ seats. Without the empennage and ruddervators Footnote 8 attached, the Beechcraft’s cockpit and wings entered a dive, resulting in an impact that was not survivable and a post-impact fire. The right ruddervator and aft portion of the empennage/tail cone of the Beechcraft remained embedded in the Piper’s fuselage. The Piper’s engine failed, and there was a loss of airspeed indication. 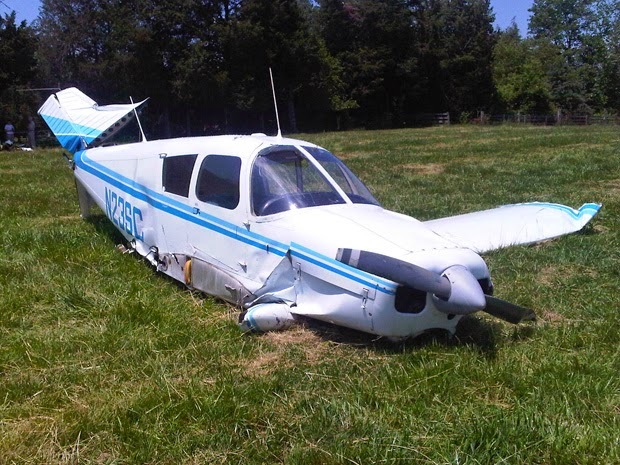 The pilot then completed a successful forced landing into a pasture. 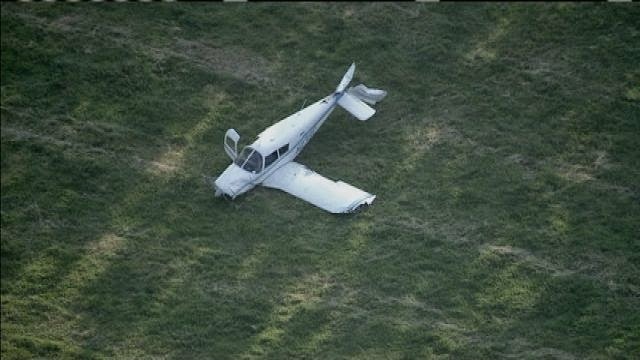 During the landing, the aircraft skidded through a narrow path in a line of trees bisecting the pasture. The right wing detached during this impact. There was no post-impact fire. 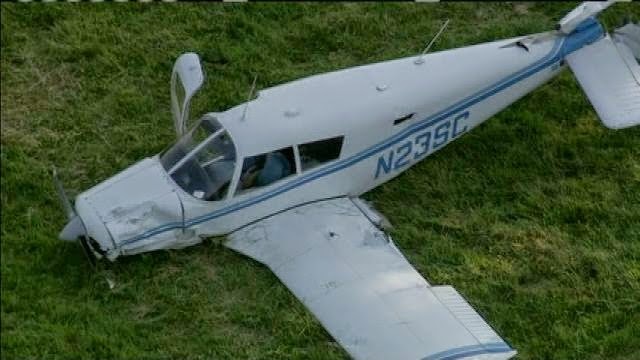 The pilot of the Piper sustained injuries during the impact with the Beechcraft, as well as head injuries during the touchdown and impact with trees. These injuries required medical attention. The Piper was not equipped with a shoulder harness. Good visual meteorological conditions were reported in the Warrenton area. The 1555 aerodrome routine meteorological report (METAR) at KHWY indicated that winds were 180° true (T) at 5 knots, visibility was 10 statute miles, sky condition was clear, temperature was 32°C, dew point was 26°C, and altimeter setting was 29.95 inches of mercury. An observation taken 10 minutes after the accident was essentially the same, except that the indicated winds were 200°T at 3 knots, and the temperature was 31°C. The elevation of the sun was 49°, with an azimuth of 258°T. The sun’s estimated bearing was 140° relative to the Piper and 093° to the Beechcraft. Records indicate that the Beechcraft pilot and instructor, as well as the Piper pilot, were certified and qualified for flight in accordance with existing regulations. Toxicology results for all pilots involved were negative. The sleep and rest history for the pilots was such that fatigue was not considered to be a factor. The Beechcraft pilot had over 1600 hours total flight time, and the instructor had just over 4000 hours. The Piper pilot had approximately 11 100 hours flight time. The original and relieving controller were certified and qualified in accordance with existing policies and regulations. Their work and rest schedules were such that fatigue was not considered to be a factor. The original controller had over 30 years total experience, with the last 9 years at PCT. The relieving controller had 21 years total experience, with 4.5 years at PCT. Records indicated that both aircraft were certified, equipped, and maintained in accordance with existing regulations and approved procedures. The Piper was a white aircraft with blue markings, while the Beechcraft was white with red markings. Nothing was found to indicate that there was any airframe failure or system malfunction prior to or during the flight. All control surfaces were accounted for, and all damage to the aircraft was attributable to the collision and impact forces. Both aircraft were equipped with functioning mode C transponders. Investigators observed that the landing light switch in the Piper was in the on position. There were no other lights for conspicuity, such as strobes, installed on the Piper. The Beechcraft had a strobe light system installed. The post-impact fire damage sustained by the Beechcraft precluded determination of any exterior lighting switch positions. From what could be determined, no devices limiting the field of view for flight in simulated instrument meteorological conditions were in use by the pilots or found in either wreckage. The FAA air traffic control manual states in part that, in Class E airspace, traffic advisory service and flight following will be provided to the extent possible, depending on the controller’s higher-priority duties and other limitations (e.g., radar limitations, volume of traffic, frequency congestion, or controller workload). Radar and non-radar traffic advisories do not relieve the pilot of his or her responsibility to see and avoid other aircraft. Pilots are cautioned that there are many times when the controller is not able to give traffic advisories concerning all traffic in the aircraft’s proximity. In other words, when a pilot requests or is receiving traffic advisories, it should not be assumed that all traffic advisories will be issued. Pilots receiving this service are advised of any radar target observed on the radar display which may be in such proximity to the position of their aircraft or its intended route of flight that it warrants their attention. This service is not intended to relieve the pilot of the responsibility for continual vigilance to see and avoid other aircraft. A safety alert will be issued to pilots of aircraft being controlled by ATC if the controller is aware the aircraft is at an altitude which, in the controller’s judgment, places the aircraft in unsafe proximity to terrain, obstructions or other aircraft. The provision of this service is contingent upon the capability of the controller to have an awareness of a situation involving unsafe proximity to terrain, obstructions and uncontrolled aircraft. The issuance of a safety alert cannot be mandated, but it can be expected on a reasonable, though intermittent basis. Once the alert is issued, it is solely the pilot’s prerogative to determine what course of action, if any, to take. This procedure is intended for use in time critical situations where aircraft safety is in question. Noncritical situations should be handled via the normal traffic alert procedures. The primary purpose of the air traffic control (ATC) system is to prevent a collision between aircraft operating in specific airspace and to organize and expedite the flow of traffic. A conflict alert system Footnote 13 was developed to assist controllers in recognizing and preventing collisions between aircraft. The purpose of the system is to determine if aircraft are in dangerous proximity to other aircraft or are on a course that will put them in dangerous proximity to other aircraft. Each aircraft track recorded by the radar system is processed by the conflict alert system once per radar scan. A primary filter reduces the number of track pairs processed by the system to a level that can be accepted by the software. A track pair that passes the primary filter is processed by 4 conflict alert detection algorithms to determine if the track pair is in conflict. To do so, the altitude and the lateral dimensions are considered separately. For example, it may be safe for 2 tracks to be at the same lateral position and separated by 500 feet in altitude, but it is not safe for tracks to be at the same altitude and separated by 500 feet laterally. A conflict situation is determined by first evaluating an altitude conflict interval. The time at which the 2 aircraft are predicted to first come in conflict in altitude is the beginning of this time interval. Next, a lateral conflict interval is determined. The time at which the 2 aircraft are predicted to first come in lateral conflict is the beginning of this time interval. If these 2 time intervals overlap, the greater of the 2 times is the time at which the aircraft pair will first come into altitude and lateral conflict concurrently. This is called the time of violation (TOV). If TOV is less than or equal to the look-ahead time, Footnote 15 then a conflict exists, and the controller will be alerted. As long as there is a conflict, the alert message will be displayed. Once all specified parameters are met, an alert is issued. When this occurs, a single aural alert, which lasts for 5 seconds, is generated at the controller’s position. At the same time, the blinking characters CA (acronym for conflict alert) appear on the controller’s display, in the first line of the data blocks of each aircraft involved. There are 2 related types of alerts that can be displayed: a CA or a Mode C intruder (MCI) alert. The only difference between a CA and an MCI alert is that in an MCI alert, only 1 aircraft in the pair is assigned a specific transponder code (i.e. associated); the other aircraft is un-associated (in this case squawking 1200). In a CA, both aircraft are tagged (i.e. associated). All software processing and display output is the same, whether 1 or both aircraft are associated. A range of adaptation parameters, such as geographic filters or aircraft manoeuvring sensitivity, can also be applied to determine whether or not an alert is to be issued. PCT does not have any approved exceptions for adaptation parameters of the conflict alert system that would suppress CA alerts. Currently, there are no adapted MCI inhibit regions at PCT. The area where this accident occurred was not in any locally adapted region. This means that the conflict alert processing would have been the same in any TRACON for these 2 aircraft as it was in PCT. PCT staff conduct a daily aural check per display, as well as a monthly system check. The CA aural alert was also verified after the accident, and was working in accordance with specified operational parameters. The CA aural alert is designed to sound for 5 seconds. The MCI conflict alert (the CA) for the Piper and Beechcraft was initially displayed at 1604:08 and lasted 51 seconds. Footnote 16 An aural alert sounded at the PCT Barin sector controller’s position at the time the alert was first displayed; the aural alert continued for approximately 5 seconds, then stopped, in accordance with the system design. The CA was first displayed for at least 2 radar updates while the 2 aircraft were 500 feet apart vertically, which is the accepted minimum separation between VFR aircraft. Footnote 17 The PCT Barin sector controller saw the alert being displayed and assessed that there was no conflict. The controller then focused again on the 2 IFR aircraft to the north. No further action was taken related to the alert. The PCT Barin sector controller did not issue a safety alert, traffic advisory Footnote 18 or any other verbal message to advise the Piper that a CA was being displayed for the aircraft prior to the collision. Once the IFR traffic was dealt with, the controller focused again on the Piper, and issued a traffic advisory to the Piper pilot. The collision had already taken place. Issue a safety alert to an aircraft if you are aware the aircraft is in a position/altitude which, in your judgment, places it in unsafe proximity to terrain, obstructions, or other aircraft. Once the pilot informs you action is being taken to resolve the situation, you may discontinue the issuance of further alerts. Do not assume that because someone else has responsibility for the aircraft that the unsafe situation has been observed and the safety alert issued; inform the appropriate controller. The issuance of a safety alert is a first priority (see para 2−1−2, Duty Priority) once the controller observes and recognizes a situation of unsafe aircraft proximity to terrain, obstacles, or other aircraft. Conditions, such as workload, traffic volume, the quality/limitations of the radar system, and the available lead time to react are factors in determining whether it is reasonable for the controller to observe and recognize such situations. While a controller cannot see immediately the development of every situation where a safety alert must be issued, the controller must remain vigilant for such situations and issue a safety alert when the situation is recognized. Recognition of situations of unsafe proximity may result from . . .
automatic altitude readouts, Conflict/Mode C Intruder Alert, . . . or pilot reports. b. Aircraft Conflict/Mode C Intruder Alert. Immediately issue/initiate an alert to an aircraft if you are aware of another aircraft at an altitude that you believe places them in unsafe proximity. If feasible, offer the pilot an alternate course of action. a. Give first priority to separating aircraft and issuing safety alerts as required in this order. Good judgment must be used in prioritizing all other provisions of this order based on the requirements of the situation at hand . . .
Because there are many variables involved, it is virtually impossible to develop a standard list of duty priorities that would apply uniformly to every conceivable situation. Each set of circumstances must be evaluated on its own merit, and when more than one action is required, controllers must exercise their best judgment based on the facts and circumstances known to them. That action which is most critical from a safety standpoint is performed first. Unless an aircraft is operating within Class A airspace or omission is requested by the pilot, issue traffic advisories to all aircraft (IFR or VFR) on your frequency when, in your judgment, their proximity may diminish to less than the applicable separation minima. Where no separation minima applies, such as for VFR aircraft outside of Class B/Class C airspace, or a TRSA [terminal radar service area], issue traffic advisories to those aircraft on your frequency when in your judgment their proximity warrants it. PCT controllers receive initial training on the conflict alert system with regards to reacting to a CA. Specifically, they are trained on the appropriate phraseology to use when informing the pilots that an alert has been observed. Controllers were not trained on the parameters or thresholds that could trigger a CA, or more precisely on what aircraft trajectory conditions must be met before the system issues an alert. Back to basics briefings, annual refresher training, and a computer based instruction (CBI) module for controllers included short presentations on safety alerts. Included in the CBI module is a number of scenario-based situations for which the controller chooses the correct phraseology for the given circumstance. The CBI module covers safety alerts, traffic advisories, and merging target procedures. In each of the above accidents, the MSAW and conflict alert software performed as designed and attempted to alert controllers about the detected hazards. However, none of the warnings resulted in timely ATC intervention because controllers were either aware of the alert but failed to take action or they remained unaware of the hazardous situation despite the activation of the alerting systems. . . . The Board is concerned about the lack of effectiveness of these alerting systems, which failed to reliably capture the attention of otherwise apparently conscientious and attentive controllers. The NTSB notes that presenting conflict alert warnings using both visual and aural methods is beneficial; the ATC task environment often requires controllers to be responsible for multiple subtasks that do not involve constantly looking at their displays. However, the current design of MSAW and conflict alert warning systems does not provide effective redundant cuing of the alert condition because the aural component of the warning automatically silences after a few seconds. The current design of these systems also does not provide any assurance that a controller has recognized and acknowledged the warning. FAA Order 7110.65 makes no distinction between VFR and IFR operations regarding the issuance of safety alerts when hazards to flight are observed. Controllers are required to use their judgment, remain vigilant for situations in which aircraft are in danger, and issue, as a first-priority duty, a safety alert when such situations are recognized. Redesign the minimum safe altitude warning (MSAW) and conflict alert systems and alerting methods such that they reliably capture and direct controller attention to potentially hazardous situations detected by the systems. Implement software changes at all air traffic control facilities providing MSAW and conflict alert services.
. . . The high false-alarm rate does not appear to induce cry wolf behaviour in the context of en route ATC conflict alerts. . . . There is no need to substantially modify conflict alert algorithms, but the conflict alert system may be modified to address difficult-to-visualize conflicts. The NTSB’s assessment of the FAA’s actions regarding recommendation A-06-44 resulted in an “open – acceptable” classification. When weather conditions permit, regardless of whether an operation is conducted under instrument flight rules or visual flight rules, vigilance shall be maintained by each person operating an aircraft so as to see and avoid other aircraft. The see-and-avoid principle is based on active scanning, the ability to detect conflicting aircraft and to take appropriate measures to avoid such aircraft. See-and-avoid can be affected by limitations in what can be seen and other activities, such as in-flight monitoring of instruments, radio communications, flight training exercises and interactions with an instructor, as well as navigation or conduct of simulated instrument approaches. This means the crew’s full attention may be diverted from active scanning for traffic. In 1991, a report was produced by the Australian Transport Safety Bureau that provides an overview of the major factors that limit the effectiveness of the see-and-avoid principle in preventing mid-air collisions. Cockpit workload and other factors reduce the time that pilots spend in traffic scans. However, even when pilots are looking out, there is no guarantee that other aircraft will be sighted. Most cockpit windscreen configurations severely limit the view available to the pilot. The available view is frequently interrupted by obstructions such as window-posts which totally obscure some parts of the view and make other areas visible to only one eye. Window-posts, windscreen crazing and dirt can act as ‘focal traps’ and cause the pilot to involuntarily focus at a very short distance even when attempting to scan for traffic. Direct glare from the sun and veiling glare reflected from windscreens can effectively mask some areas of the view. Visual scanning involves moving the eyes in order to bring successive areas of the visual field onto the small area of sharp vision in the centre of the eye. The process is frequently unsystematic and may leave large areas of the field of view unsearched. However, a thorough, systematic search is not a solution as in most cases it would take an impractical amount of time. The physical limitations of the human eye are such that even the most careful search does not guarantee that traffic will be sighted. A significant proportion of the view may be masked by the blind spot in the eye, the eyes may focus at an inappropriate distance due to the effect of obstructions as outlined above or due to empty field myopia in which, in the absence of visual cues, the eyes focus at a resting distance of around half a metre. An object which is smaller than the eye’s acuity threshold is unlikely to be detected and even less likely to be identified as an approaching aircraft. The pilot’s functional visual field contracts under conditions of stress or increased workload. The resulting ‘tunnel vision’ reduces the chance that an approaching aircraft will be seen in peripheral vision. The human visual system is better at detecting moving targets than stationary targets, yet in most cases, an aircraft on a collision course appears as a stationary target in the pilot’s visual field. The contrast between an aircraft and its background can be significantly reduced by atmospheric effects, even in conditions of good visibility. An approaching aircraft, in many cases, presents a very small visual angle until a short time before impact. In addition, complex backgrounds such as ground features or clouds hamper the identification of aircraft via a visual effect known as ‘contour interaction’. This occurs when background contours interact with the form of the aircraft, producing a less distinct image. Even when an approaching aircraft has been sighted, there is no guarantee that evasive action will be successful. It takes a significant amount of time to recognise and respond to a collision threat and an inappropriate evasive manoeuvre may serve to increase rather than decrease the chance of a collision. Because of its many limitations, the see-and-avoid concept should not be expected to fulfil a significant role in future air traffic systems. Finally, the see-and-avoid concept misleads pilots and controllers by encouraging overconfidence in visual scanning while neglecting its physical and behavioral limitations and mitigation strategies. While visual scanning is necessary to prevent midair collisions, especially of aircraft flying slowly in close proximity and not yet on collision courses, it is not sufficient. Potential mitigation strategies include: 1) pilot and ATC training on physical and behavioral limitations of the see-and-avoid concept; 2) ATC safety alerts and recommendations in all conflict situations; 3) reliable altitude-encoding transponders activated at all times in all aircraft; 4) standard traffic pattern entry, exit, and circuit procedures at all airports; 5) standard communications, and position announcements in the traffic pattern, at all airports; 6) standard procedures for announcing positions and headings in arrival and departure areas, corridors, scenic areas, and other high-density areas; and 7) affordable and reliable collision avoidance technologies in all general aviation aircraft. Aircraft conspicuity must also be considered when evaluating the see-and-avoid principle. Specific paint schemes and patterns may have an advantage in certain conditions, but none has an overall advantage over another. Footnote 28 Footnote 29 Footnote 30 Anti-collision lights and strobe lights do not have a significant effect in bright daylight, Footnote 31 and landing lights are effective only when the opposing aircraft is in the direct beam.
. . . until technological solutions such as on-board collision-protection systems are mandated, a significant risk of collision between VFR aircraft will continue to exist in congested, high-density airspace areas in Canada. The Board notes that the risk of collision will increase as this traffic continues to grow, and see-and-avoid remains the primary means of defence. In addition, the Board recognizes that technological innovation is creating potential solutions that are both viable and economical. Neither aircraft was equipped, nor was required by regulation to be equipped, with any form of aircraft collision avoidance technology. Several forms of this technology are in use today, and their features are summarized in Appendix D– Airborne Collision Avoidance Systems. One such system, the Traffic Information System (TIS), was analysed to determine whether a timely alert could have been produced had either aircraft been equipped with this technology. Figure 2 and Figure 3 represent images from an NTSB simulation of the TIS messages that potentially could have been sent to the Piper and the Beechcraft had they been equipped with the avionics necessary to receive and display the messages. The simulated images are based on raw radar returns, and not the smoothed or filtered returns used by the actual FAA TIS. Nonetheless, the simulation is representative in terms of the type and timing of the alerts that potentially could have been provided to both airplanes. It is important to note that when proximity alerts Footnote 33 are elevated to traffic alerts, Footnote 34 an aural "traffic" alert is also sounded. This would have occurred at 1604:17 for the Piper, showing the Beechcraft 500 feet below, at about the 9-10 o’clock position, and less than 1 mile. A traffic alert would have been provided to the Beechcraft at 1604:13, showing the Piper 500 feet above, at the 2‑3 o’clock position, and less than 1 nm. The collision occurred at about 1604:45, so the aural alerts could have provided about a 30-second warning. For the field-of-view analysis (TSB Laboratory Report LP119-2012), the azimuth and elevation angles of the window boundaries and wings were determined, for both the Piper and the Beechcraft, based on the interior and exterior dimensions of these airplanes, as measured using the NTSB’s FARO laser scanner Footnote 35 with the assistance of NTSB investigators. The laser scanner produces a point cloud Footnote 36 generated by the reflection of laser light off objects in the laser’s path, as the scanner sweeps through 360° of azimuth and approximately 150° of elevation. The 3-dimensional coordinates of each point in the cloud are known, and the coordinates of points from multiple scans, resulting from placing the scanner in different positions, are merged by the scanner software into a common coordinate system. By placing the scanner in a sufficient number of locations, so that every part of the airplane is scanned, the complete exterior and interior geometry of the airplane can be defined. In this study, the scanner was placed in 8 locations to scan the exterior of the airplanes, and in both the pilot and co-pilot seats to scan the interior of the airplanes. The scanner software was then used, with the interior scans, to identify the points defining the outline of the cockpit windows. The exterior scans were used for the left and right wings. The coordinates of these points were exported from the scanner software and imported into Microsoft Excel. In Excel, the coordinates were transformed into the airplane’s body axis system and, ultimately, into azimuth and elevations angles from the pilot’s eye position. The TSB was designated to conduct an investigation into this accident in order to make findings as to the causes and contributing factors and identify safety deficiencies under a memorandum of understanding (MOU) signed with the NTSB. The MOU identified that the respective agencies would be bound by the standards included in Annex 13 to the Convention on International Civil Aviation – Aircraft Accident and Incident Investigation concerning accident and serious incident investigations. Additionally, the MOU provided that the investigation was to be conducted in accordance with the Canadian Transportation Accident Investigation and Safety Board Act, as well as TSB standard operating policies and practices. An NTSB investigator was appointed as the accredited representative for the United States to the TSB investigation, under Chapter 5 of Annex 13 to the Convention on International Civil Aviation. The accredited representative was to be the sole point of contact between the NTSB and the TSB for the purposes of the investigation. Other NTSB personnel and NTSB board members were not to be involved in any aspect of the investigation other than providing information requested by the TSB investigator-in-charge through the accredited representative. Given the events leading up to the mid-air collision, this analysis will focus on why the 2 aircraft, operating under visual flight rules (VFR), were unable to avoid one another on the basis of the see-and-avoid principle and why, although the controller had received a conflict alert, no safety alert was issued prior to the collision. Separation of VFR aircraft is predicated on the principle that pilots will see and avoid other aircraft. However, the limitations of the see-and-avoid concept do not always permit pilots to do so. The 2 aircraft were on a constant collision course for approximately 37 seconds, during which there would have been no relative angular movement to aid in detection by the pilots’ peripheral vision. The pilots’ activities in both aircraft created a workload that would have reduced the time devoted to scanning for traffic. The Piper pilot was preparing for a simulated instrument approach; the Beechcraft pilot was completing various exercises during a flight check. The relative position of each aircraft was such that the approaching aircraft were not in the forward view of either pilot. Had either pilot looked in the general direction of the approaching aircraft, the relatively large area of view masked by the natural blind spot of the eye could have easily obscured the small target that was the aircraft. Due to the converging courses, there would have been little to no relative movement of either aircraft and as such, the human visual system would have had difficulty detecting the aircraft. From the Piper pilot’s perspective, the Beechcraft was approaching from below, and the ground features would have presented a complex background, which would make detecting the aircraft more difficult. The investigation could not determine to what extent the pilots were actively scanning for other aircraft. The inadequacies of the see-and-avoid concept are further compounded when aircraft are operated in congested, high-density airspace, as was the case in this accident. Air traffic control (ATC) has technology that controllers can use to alert pilots of potential conflicts with other aircraft. In this accident, when the conflict alert (CA) was triggered, the 2 aircraft were 500 feet apart vertically, which is the accepted minimum spacing between 2 VFR aircraft. At first, there was no indication that either aircraft was climbing or descending. The initial CA, and the first update for the 2 aircraft targets 5 seconds later, showed the aircraft maintaining a vertical spacing of 500 feet. The controller assessed that there was no conflict between the 2 VFR aircraft and therefore did not issue an immediate safety alert. The controller would have had to monitor the aircraft for 10 to 15 seconds to determine that a risk of collision existed. In this case, a CA was triggered when the aircraft were less than 600 feet apart vertically, and the software algorithm determined that the 2 aircraft were on a converging course if they continued to proceed at their current speed and heading. If a controller determines, through observation, that there is no immediate threat to the safety of the 2 aircraft, no action is required. The controller also perceived that the separation between the 2 crossing IFR aircraft was not assured, which required detailed monitoring. The controller’s attention was therefore directed to these 2 aircraft, and not to the 2 VFR aircraft, neither of which had been radar identified prior to the collision, and neither of which was being provided ATC services at that time. The controller was busy communicating with several other IFR aircraft, which precluded further monitoring of the 2 VFR aircraft. Controllers are required to make a judgment whether or not the CA is valid and to make a decision on the appropriate course of action (for example, issuing a safety alert). Alerts are not mandatory for every CA, but depend on a controller’s judgment based on the data displayed for a particular aircraft pair. At the time of the initial CA and of the first update of the 2 aircraft targets 5 seconds later, the radar display showed the aircraft maintaining a vertical spacing of 500 feet. In this occurrence, the defences available to avert a mid-air collision failed. These defences were the see-and-avoid principle and ATC services in the form of radar surveillance and collision alerting. Current aircraft-based collision avoidance systems vary in cost, complexity, and functionality. However, had 1 or both of these aircraft been equipped with some form of the technology, the risk of collision would have been reduced. Neither pilot saw the other aircraft in time to avert a mid-air collision, likely due to the inherent limitations of the see-and-avoid principle. Following the receipt of a conflict alert, the controller assessed that there was no conflict between the 2 visual flight rules (VFR) aircraft and therefore did not issue an immediate safety alert. Subsequently, the controller was busy communicating with several instrument flight rules (IFR) aircraft, which precluded further monitoring of the 2 VFR aircraft. In the absence of a means of alerting visual flight rules (VFR) pilots to potential conflicts to enhance the current see-and-avoid technique, the risk for mid-air collisions remains. The lack of a shoulder harness in the Piper contributed to the pilot’s injuries during the forced landing. This memo is to advise that in addition to the documented Refresher Training and classroom instruction, the training of new Academy Graduates (AG’s) and Certified Professional Controllers in Training (CPCIT’s) also includes activation of Conflict Alert while in Enhanced Target Generator (ETG) simulation training. During the course of simulation training, CA is activated due to the trainee not recognizing created or built in conflicts of aircraft tracks. Instructors teach the trainees their responsibilities and how to react to these “Conflict Alerts”. ETD45G Scenarios are fabricated with built in conflictions that teach the trainee to recognize confliction points and how to react to the Conflict Alert activation. Students are taught Traffic Alert responsibilities and priority of duty requirements. This accident has demonstrated yet again that relying solely on the see-and-avoid principle to avoid collisions between aircraft operating under visual flight rules (VFR) in congested airspace is inadequate. A number of international studies have addressed the overall issue of the effectiveness of the see-and-avoid principle, as well as the risks of collision associated with this principle. All acknowledged the underlying physiological limitations at play and that, when mid-air collisions occur, "failure to see-and-avoid is due almost entirely to the failure to see." Footnote 37 One study stated that "our data suggest that the relatively low (though unacceptable) rate of mid-air collisions in general aviation aircraft not equipped with TCAS [traffic alert and collision avoidance system] is as much a function of the ‘big sky’ as it is of effective visual scanning." Footnote 38 A British Royal Air Force study into mid-air collisions, which were deemed to be random, found that the probability of conflict is proportional to the square of the traffic density, and recommended avoiding altitude restrictions that concentrate traffic. Footnote 39 Measures such as improving aircraft conspicuity, pilot scanning techniques, and pilot traffic awareness can reduce risks, but they do not overcome the underlying physiological limitations that create the residual risk associated with a see-and-avoid method without alerts. As VFR traffic increases, additional lines of defence should be considered to reduce the risk of a mid-air collision. These lines of defence could include: changes in airspace classification, increased air traffic control (ATC) intervention, as well as ground-based and on-board technology. Changes in airspace classification can be implemented to increase the provision of dedicated ATC services, including separation and traffic advisories, to VFR aircraft operating in congested airspace. In such cases, ATC sectorization and controller workload must also be carefully reviewed to ensure that controllers have the appropriate resources to effectively manage air traffic under their jurisdiction. Controllers can use ATC-based technology to alert pilots of potential conflicts with other aircraft. However, the effectiveness of such systems also depends on controller judgment and workload. The National Transportation Safety Board (NTSB) has previously expressed concern and made recommendations to improve the effectiveness of such conflict warning systems. A meaningful improvement to the ability to see and avoid other VFR aircraft may require on-board technology capable of directly alerting pilots of the proximity of conflicting traffic. As outlined in this report, a number of viable and economical on-board alerting systems exist or are under development. These technologies also offer the potential to reduce the risk of mid-air collisions. Intended for general aviation and regional airlines. Issues traffic advisories (TA) that assist pilots to visually acquire target aircraft. Active system consisting of a transmitter, receiver, directional antennas, computer and cockpit displays. Transmits a signal (interrogation) that will be received by a transponder equipped (Mode C) aircraft. This aircraft will respond to the interrogation and reply. The system will interpret the reply and calculate the distance and direction of the responding aircraft. Able to determine the responding aircraft’s relative altitude and whether it is climbing or descending. Issues a traffic advisory (visually and aurally) if a potential conflict is determined. The FAA mandated that TCAS I be installed on aircraft with 10 to 30 seats. Provides a basic level of surveillance to flight crews. Requires that conflicting aircraft be equipped with a transponder. Only transmits on 1030/1090 MHz frequencies - As the density of TCAS equipped aircraft increases, there is a corresponding increase in interrogations of transponders. Provides advisory alerts only; the crew is still required to assess the situation and determine a resolution. Issues traffic advisories (TA) that assist pilots in visually acquiring target aircraft. Analyzes the projected flight path of approaching aircraft and will issue resolution advisories (RA) to the crew in order to resolve potential conflicts. The RA will advise the pilot to climb or descend in order to resolve the conflict. Some models may also advise the pilot not to manoeuvre. Required internationally in aircraft with more than 30 seats or weighing more than 15 000 kg. When resolving conflicts with TCAS II-equipped aircraft, the TCAS II units will co-ordinate RA in order to avoid mirroring their manoeuvres. Conflicting aircraft are required to be equipped with transponders. Restricted to provide commands for vertical manoeuvring, and not for turns. If not communicated to ATC in a timely manner, RA manoeuvring may cause the controller to issue avoidance instructions that may conflict with RA. Interrogates other Mode A, C and S transponder systems and listens for a target reply, and then calculates as much of distance, relative bearing, altitude and vertical trend as possible. Issues a traffic alert (TA) if the system calculates a collision course. Works on the ground and will work with any aircraft with an installed and functioning transponder. Lower cost evolution of TCAS. Installations are significant; include heavy and large remote processors and complex antenna work. Passive system that listens for a 1090 MHz transponder transmission. Can be temporarily mounted on the dash or permanently panel mounted. Certain units can provide directional and altitude information from transponder-equipped aircraft (altitude information can only be provided from aircraft equipped with transponders with altitude-encoding capability). The maximum range is approximately 6 nm. The parent unit will interpret the target’s coded data and provide a relative position and altitude. Relatively inexpensive, with a minimal investment in installation. When coupled with GPS mapping equipment, the relative position of target aircraft can be better appreciated. Requires target aircraft to be transponder-equipped, and that the target aircraft be interrogated by an ATC ground station (or from airborne TCAS-equipped aircraft) resulting in the transponder replying to that interrogation. Depending on where the unit is located, there is a potential for shadowing by the parent aircraft’s structure. Units have also been reported to alert bogus targets. It has been suggested that this may be due to the unit reading the parent aircraft’s transponder signal. Ground-based service that utilizes the Mode S datalink to communicate colli­sion avoidance information to the aircraft. The system can show location, direction, altitude and climb/descent trends of other transponder-equipped aircraft within 5 nm and 1200 feet of your aircraft. Threat traffic infor­mation can be displayed on the Mode S transponder or a variety of cockpit units including many popular multi-function displays. Requires aircraft to be Mode S transponder equipped. Ground-based; aircraft can fly out of range. Needs a multi- function cockpit display. System being implemented by the FAA; ADS-B (Out) implemented by 2020. Each aircraft is responsible for its own navigation and separation. ADS-B aircraft transmit their identification, speed and vertical and horizontal positions to a global navigation satellite system (GNSS). This information would be rebroadcast by the GNSS to other ADS-B-equipped aircraft and ground stations (ATC). Information will be broadcast on 1090 MHz or 978MHz. The system is not radar dependent, therefore distance from a radar site and terrain will not interfere with the transmission/reception of data. The system will provide pilots and air traffic controllers with real-time precise aircraft position information. Not many aircraft are equipped with this equipment, so there will be a reliance on traditional radar until such time as the program has been implemented. Obtains its position from an internal GPS and a barometric sensor and then broadcasts this with forecast data about the future 3D flight track. Its receiver listens for other FLARM devices within typically 3-5 kilometres and processes the information received. Motion-prediction algorithms predict potential conflicts for up to 50 other signals and warn the pilot using sound and visual means. Can store information about static aerial obstacles, such as cables, in a database. The system’s serial data protocol is public, while the prediction engine of the FLARM radio-protocol is proprietary and licensed to manufacturers. The prediction engine itself is patented by Onera (France). Provides visual and acoustic warnings for aircraft and fixed obstacle. Optimised for the specific needs of small aircraft such as gliders, not for long-range communication or ATC interaction. Requires other aircraft to be equipped with FLARM. This report concludes the Transportation Safety Board's investigation into this occurrence. Consequently, the Board authorized the release of this report on 17 April 2013. It was officially released on 21 June 2013. A federal judge in Virginia has issued a $5.4 million judgment against the U.S. government after finding that an air traffic controller was negligent for a deadly midair crash involving three experienced pilots, including the former chief medical officer of the U.S. National Transportation Safety Board. Thursday’s judgment awarded damages to the widow of an FAA-certified flight instructor, who was conducting a flight training review of the NTSB official, James Duncan, when both were killed in the 2012 crash. 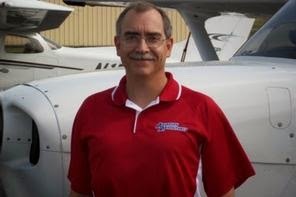 The pilot of the other plane, Thomas Proven, who is an accident investigator for the FAA, survived. “It’s one of the cases that continue to show you’ve got to be diligent as an air traffic controller because you really do have other people’s lives in your hands,” said Jim Beasley, managing member of The Beasley Firm in Philadelphia, who represented Joyce Gardella. Lawyers from the Justice Department and the U.S. attorney’s office in the Eastern District of Virginia defended the air traffic controller in the case. Calls to both offices weren’t returned. 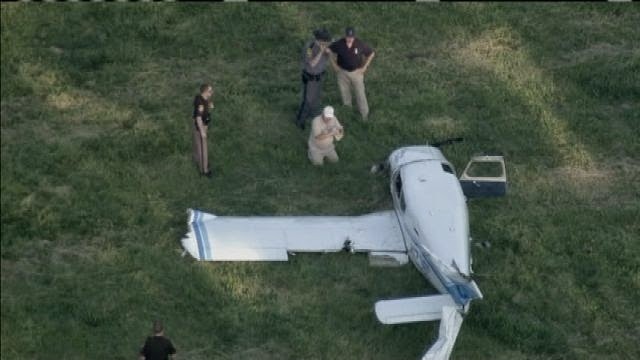 Gardella’s husband, Paul Gardella, the passenger in a Beechcraft V35B Bonanza, and Duncan, the pilot, took off from Warrenton-Fauquier Airport in Warrenton, Virginia. Proven was heading to that airport in a Piper PA-28 Cherokee. The air traffic controller, Shane Keenley, received a conflict alert involving the two aircraft but, determining that both were still 500 feet apart, did not warn the pilots. In 2014, the Transportation Safety Board of Canada, which investigated the crash due to the involvement of NTSB and FAA officials, concluded that the pilots had failed to see each other. Joyce Gardella sued last year under Virginia’s Wrongful Death Act claiming the U.S. government was liable under the Federal Tort Claims Act. DOJ lawyers argued that her husband should have seen the other aircraft. U.S. District Judge Liam O’Grady, who conducted a bench trial in November, disagreed. “Mr. Keenley did not use his best judgment when he decided that issuing a safety alert was not necessary in this case,” O’Grady of the Eastern District of Virginia wrote. O’Grady also concluded that Gardella’s own negligence did not contribute to his death—an important ruling that allowed his wife to get one of the highest damages amounts in a Virginia plane crash against the U.S. Damages included $1.2 million in lost income and $2.3 million in emotional damages to Gardella’s wife, plus $500,000 to each of his three adult children. Proven, who sued last year for $250,000 in injuries and loss of his plane, settled with the U.S. government on Sept. 17. This is preliminary information, subject to change, and may contain errors. The foreign authority was the source of this information. 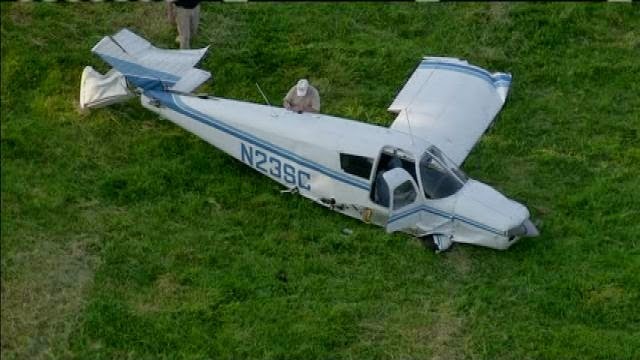 On May 28, 2012, about 1604 eastern daylight time, a Beech V35B, N6658R, and a Piper PA-28-140, N23SC, collided in flight in the vicinity of Sumerduck, Virginia. The Beech was destroyed, and the pilot and flight instructor were fatally injured; the Piper was substantially damaged, and the pilot was seriously injured. Neither of the local flights was operating on a flight plan, and both were being conducted under the provisions of 14 Code of Federal Regulations Part 91. Day visual meteorological conditions prevailed. The Beech departed Warrenton-Fauquier Airport, Warrenton, Virginia, on a flight review for the private pilot, and the Piper departed Culpeper Regional Airport, Culpeper, Virginia, on a personal flight. The pilot/owner of the Beech was an employee of the NTSB, and the pilot/owner of the Piper was an employee of the Federal Aviation Administration (FAA). Under the provisions of Annex 13 to the Convention on International Civil Aviation and by mutual agreement, the United States delegated the accident investigation to the government of Canada. The NTSB designated an accredited representative to the investigation on behalf of the United States, and the FAA designated an advisor to the accredited representative. This report is for informational purposes only, and only contains information released by or provided to the government of Canada. At 1555, the northbound Beechcraft was 13 nautical miles (nm) south of the Culpeper Regional Airport (KCJR) at 3000 feet asl. At this time, the Piper PA-28-140 departed KCJR under visual flight rules (VFR) and was climbing eastward. At 1600, the Beechcraft started a descent (Figure 1). As the Beechcraft descended, their closest point of approach was 600 feet vertical and 0.9 nm lateral. 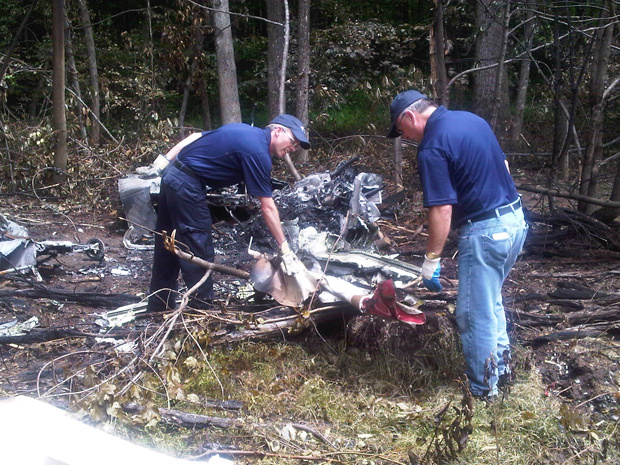 Investigator in Charge John Lee and three other investigators from the Transportation Safety Board of Canada will conduct a probe and write a report about May 28, 2012 mid-air collision over Sumerduck in Fauquier County, Virginia. "Over the next few days, we'll be looking at the man, the machine and the environment," Lee said, giving a general description of the "field investigation." Because the accident involved private planes, flown by pilots employed by the Federal Aviation Administration and the National Transportation Safety Board, the heads of those agencies requested outside investigators. Transportation Safety Board of Canada Inspector in Charge John Lee conducts a press conference at the Hampton Inn in Warrenton. Plane crash site in Fauquier County. 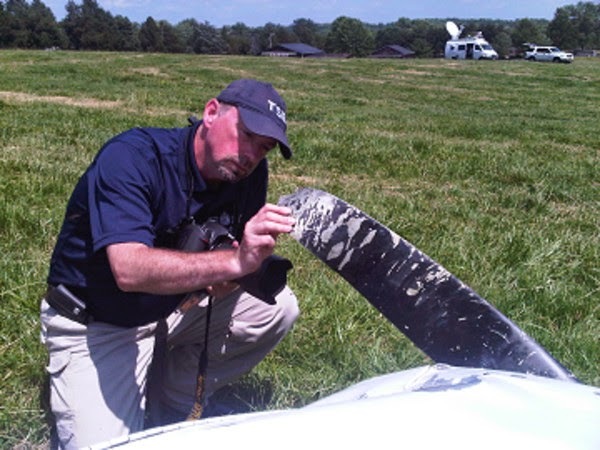 Investigator Brad Vardy inspects the Piper PA-28 that collided with another plane near Sumerduck.